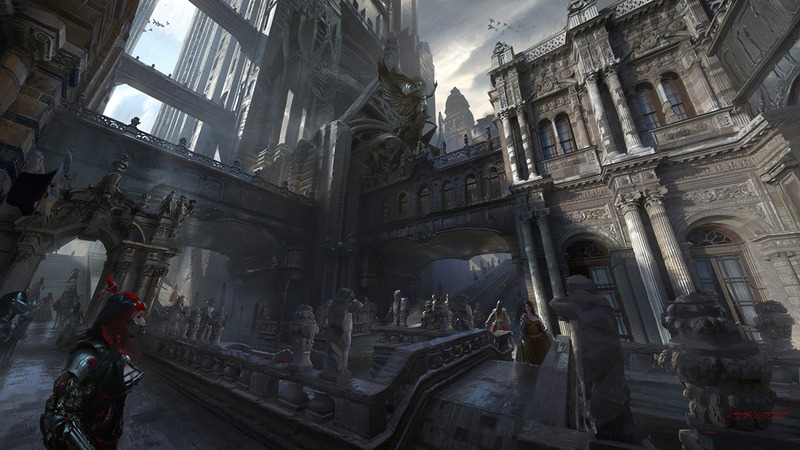 Christopher Schiefer is a young Concept Artist, currently living in Chemnitz, Germany. Surprisingly, Christopher first discovered digital whilst he was working his old job way back in 2012. 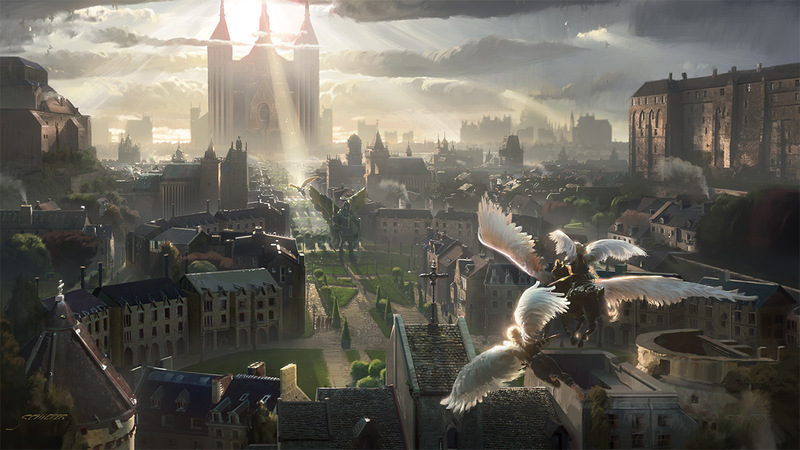 “I was working as a Graphics Programmer and a Technical Artist before I knew about Digital painting.” He told us. After that, he would go on to spend the next four years creating over a thousand paintings. Christopher was working tirelessly to improve through continued practice, art courses and a mentorship with none other than Wojtek Fus. If you take a look at the things he produced in 2012 – comparing it to the work he’s doing now – you’ll see that hard work really does pay off. His new artworks – the ones like Crescendo and Grand Staircase – are absolutely stunning and we asked him to walk us through how he made them. When we interviewed Christopher, he said that he would also like to become a mentor in the future. And this is because Wojtek guided him well, saving him from years’ worth of trial and error by showing him the proper way to do things. Christopher’s desire to advise and guide other young artists is perfectly understandable, especially if you stop and think about how much his mentor did for him. The aspiring artists reading this will be happy to know that Christopher will begin teaching soon – covering complex techniques, useful skills and the workflow. These will be available as video tutorials on his Gumroad. Of course, his mentorships will also be announced in the near future, so you can all look forward to that! And now, without further ado, enjoy the rest of this interview. What sparked your interest in digital art? I was working as a Graphics Programmer and a Technical Artist before I knew about digital painting. Spending my time implementing various academic papers and developing shaders for real-time graphics rendering engines. I ended up implementing so many different things that I started to think up ways of escaping this infinite loop. I discovered Feng Zhu and began working on some of the worst paintings I’ve ever done. Despite the quality of the art, I loved it so much that I was progressively painting more and more. I could apply my research skills to studying everything about art history, learning techniques whilst constantly working on my fundamentals. Four years, over a thousand paintings, a mentorship and an art course later, I decided to fully pursue it with all of my strength and dedication. I can tell that I don’t regret going from a career in programming to a career as an artist. I love every minute of it. Walk us through the processes you used when creating your newest portfolio artworks (Grand Staircase and Crescendo). After doing all of those courses and practicing for so long, I came to one conclusion: “ground truth.“ I was developing a workflow; one that would work well with any artwork, and any restrictions to the design. I wanted to minimize human mistakes as much as possible. Painting by hand almost always makes room for error so I don’t want to rely on it too much at all. “Ground truth” is essentially the most accurate and physically plausible way. My workflow comes in different stages. There are a lot of “ground truths” in this workflow which eliminates a lot of the problems all at once. I will teach my workflow and many more skills and techniques in the tutorials on my Gumroad. I will announce mentorships very soon too. Do you have any tips and tricks for concept artists who are wanting to speed up their workflow? I do believe if you want to Improve your speed, you also have to maintain the same quality! Don’t sacrifice quality for a faster workflow, find workarounds and try your best to reach the “ground truth” faster instead. This is a complete game changer and it will lead you to both quality and speed! If I would’ve had the chance to scold – the me from three years ago, I would have told myself do it accurately, do it properly and never ever guess. The most important thing is to not get stuck with the same workflow over and over again. Try to develop your workflow in a way that will get you to those two destinations. Both speed and quality are very important. If you do that, then you will have a strong workflow after a couple of years. Take courses and mentorships to get a fresh perspective and clear up your biased opinions on how to do art. Another tip is to do statistics and analyze your progression, finding all of the bottlenecks in your workflow. These tips actually work with just about everything. You can apply the same to something like social media marketing, or in this case, concept art. You said that you were mentored by Wojtek Fus. What are the most important things you learned during your time together with him? 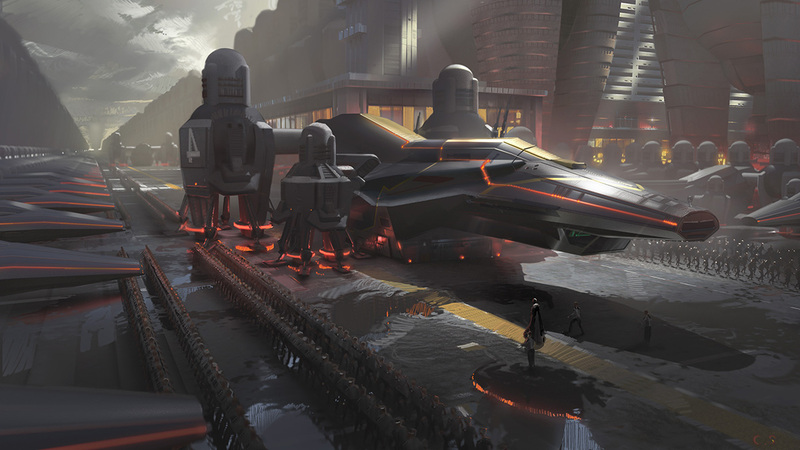 I was very biased before Wojtek mentored me and taught me how to approach concept art the right way. He told me everything I needed to know in order to go in the right direction. He saved me years of trial and error by simply directing me. I had all of my art fundamentals down already, but I never knew what to do with them. This is why I have such a high opinion of mentorships. It can save you years of your own life, because someone is telling you everything they know from their point of view. This is why I want to be a mentor as well. I want to save artists from being trapped in that void. I want them to reach their dreams much faster. Because they can do what they love, learning in a way that sets them up to head in the right direction. The gaps between the working professional and the ones who simply try really hard is huge. It’s tough to get through it too, unless you are willing to change your entire mindset. There are a lot of online courses available on websites like Learn Squared. Should beginner artists be taking them? Learn Squared Courses are absolutely amazing. You learn a great deal about all of the things you can’t find for free online. An example of this would be Maciej Kuciara’s insights, you never even thought about it, but it will change your way of thinking entirely. I was taking the Intro to Environment Painting course, and after the second lesson, I was already seeing my way of thinking change rapidly, which made the quality of my paintings skyrocket. Once again, they can change your biased mindset, leading you to your goals much faster than trying to achieve it all alone would. Tell us a little bit about the commercial work you do. Are you working on any notable projects right now? 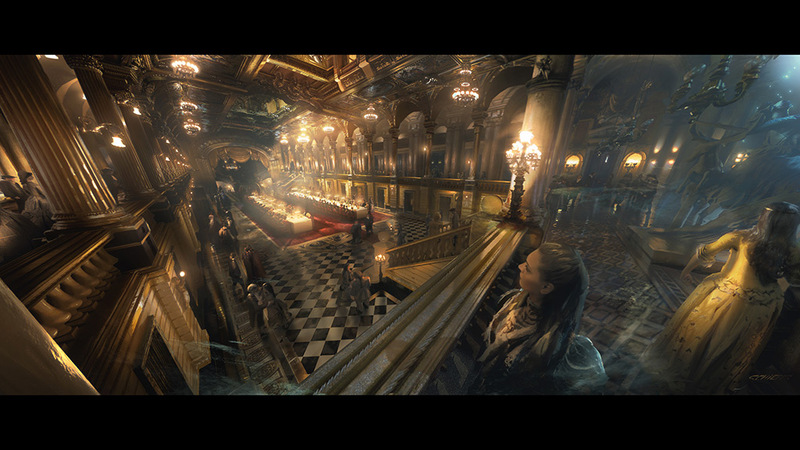 I worked as a Key Background Stylist for a while, and I was a Technical Artist before that. I am currently working on smaller freelance jobs, but I’m on the list to do some environment paintings for studio Volta, so I’m looking forward to that. Are there any dangers that aspiring artists should be wary of when working their first paid gig? I think that you’re alright if you actually have the job, but will you get a second one? You need to try and make sure you have a sufficient amount of work. Trying to contact different art directors and showing them your portfolio might be a good start. You will have all you need if you make this into a routine. What’s next for Christopher Schiefer? I would like to spend more time focusing on teaching. I want to help those who are struggling to improve, because I want to see them grow on a much larger scale. My dream is to make the gap between a beginner and a working professional much smaller, giving them all the hope that they need. © Christopher Schiefer or their respective copyright holder. Publishing rights for this article have been synchronized with Momenta. The Artist’s Roundtable: Why Do We Follow Trends? Will Santa Claus Bring Traditional Animation Back?